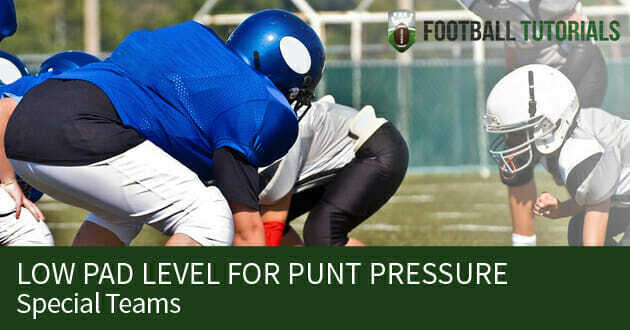 The punt pressure team consists of both the punt block and punt return so this is a great drill that blends both of these position skills. It doesn’t matter is you are a punt block team, a punt return team or a combination of both, you need to have great “Get Off”. This punt pressure drill is called “Get Off and Bend”. By putting the bend into the got off part of the drill, you can evaluate personnel to see if they are punt blockers, and also to teach players the proper technique for punt block. A center will be facing them on the side of the square, and 2 target players (the kicker) will be holding a football extended out to be blocked. On the center’s hand movement of the snap, the rushers will burst off the line towards the kicker, with the goal of knocking the ball away. – You also want to make sure that the hands are together with crossed thumbs. If you go after the ball with one hand, that doesn’t allow you to use your palms and fingertips. Also, you don’t have to slap the ball down, just put hands on it. You don’t want to slap the ball down because you might miss it, and you can’t be called for a penalty of roughing the kicker. – Use a sprinter stance and sprinter foot action – with either the right foot or the left foot back – which depends on the length that the rusher can handle – he needs to be able to get his outside foot, or “plant foot”, slightly ahead of what is even with the blocker so that he can take and point just like a defensive line on a pass rush, point it towards the block point. – In the sprinter stance, the back foot should not be all the way back, and his first step is going to replace the down hand so that he keeps a low pad level. – One of the problems with rushers is that they get to that first step with their chest up, and then they can be driven out with a hand. By keeping down and a low pad level, there is no surface for him to be blocked. – The offhand should be cocked up on the side, and the player is going to drive that hand right through and “comb away” so that he can force more acceleration. You will notice that if the player does not get a full thrust with his hand, he is not going to get great take off. 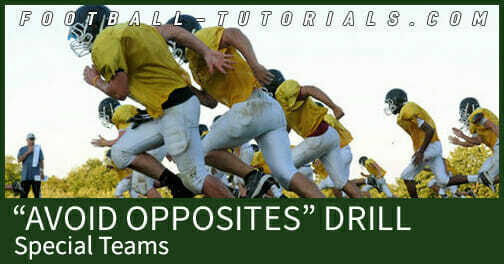 For more awesome punt pressure and special teams drill ideas, be sure to Become a Fan on Facebook! You can also Follow Me on Twitter and Hangout with Us on Google+!